The State Collaborative on Reforming Education (SCORE) has released the following statement from Executive Chairman and CEO Jamie Woodson about approval from the U.S. Department of Education for Tennessee’s Every Student Succeeds Act plan. Tennessee Succeeds, the state’s plan under the Every Student Succeeds Act, applies state-specific solutions for meeting the needs of Tennessee students. Stakeholders from across the state provided input to the Tennessee Department of Education as the proposal was developed so that it met the needs of all Tennessee students, particularly historically underserved students. Three key parts of the plan will be vital to helping students achieve more. First, there now will be success measures for every school so parents, educators, and community members can understand whether all students are being served well. In particular, more schools will receive data about the academic success of students of color, low-income students, students with disabilities, and English learners. Second, the plan creates an innovative “ready graduate” measure that should increase opportunities for high school students to earn college credit or industry certification. Finally, it establishes a clearer and more comprehensive approach to turning around low-performing schools in collaborative ways. 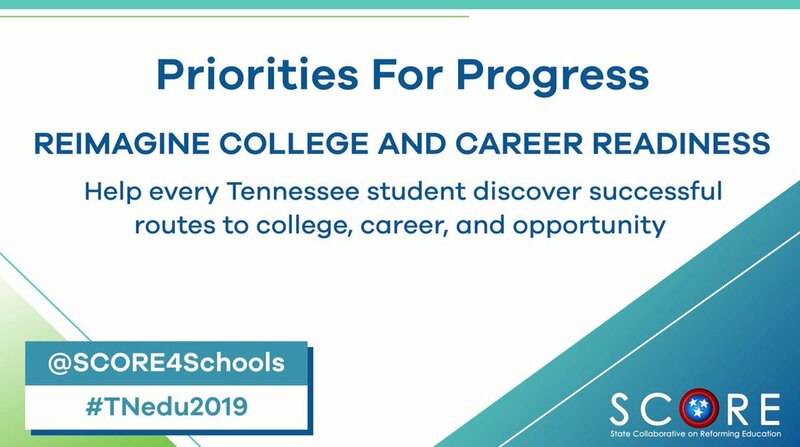 It is now important for SCORE, the Tennessee Department of Education, and all partners to support our educators as they put this plan to work for students.